The site fronts on Little Creek Waterway with boating access to Pretty Lake surrounded by recreational and mixed-use water views. It is the focal point at the terminus of Pretty Lake Avenue and serves as a gateway to other residential neighborhoods. Bay Point Condominium will be a link between a redevelopment zone and the re-established residential area. 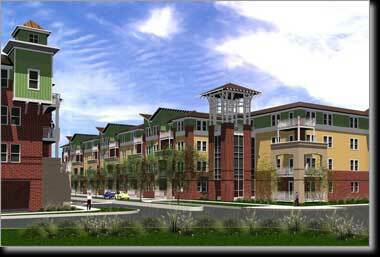 The 68 unit multi-family development over two four-story buildings is the appropriate vision for the project. One, two, and three bedroom units range in size from 1,000 sf. to 2,140 sf. The project includes a full-service restaurant and marina. Coastal vernacular architecture will provide a fresh and spirited family of details to the large buildings.